Ruby Armani (5 m Makfi – Trujillo, by Saint Ballado) not only made her owners in the B.A.X No. 2 Syndicate very happy with an outstanding win on Friday at Tauranga, but also the Punters Club that invested $5,572 to collect $27,860. Selected by Neil Davis (Formpro) for the punters on course that bought a $10 ticket – with an eventual guaranteed return of $40 – Ruby Armani was dropping back in grade after contesting the Auckland Thoroughbred Breeders’ Stakes (Gr. 2, 1400m) and the beneficiary of positive tactics and a terrific ride by Patrick Moloney in the Kiwifruit Investments Rating 70 1400 metres. Generally allowed to find her feet in the run, co-trainer Pam Gerard said before the race that it was “now or never” with regard going forward to secure a handier position with a mare that has tended to over-race at times. Beginning well to lob the one-one, Ruby Armani travelled best when ranging to the leaders on straightening and once Moloney asked her to extend at the 250 metre she quickened away to win by two and a quarter lengths. On Good3 footing, Ruby Armani ran the 1400 metres in 1:24.1, last 600m in 35.1, and $4.00 & $1.70 on the NZ TAB tote. “She’s a lovely mare with a lot of ability,” Gerard said. “I guess we’ve always hoped to get some black type with her. 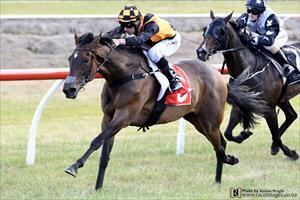 She’s improving with racing against some very tough horses and back in grade today was ideal for her." When pinch-hitting a fortnight earlier for suspended countryman Jake Bayliss, Moloney bagged wins on two-year-old debutante colt Bocce (Foxwedge) and aboard three-year-old Alamosa colt On The Rocks in the Trevor Eagle Memorial (Listed, 1500m). “It’s a team effort from Ballymore Melbourne and Ballymore here, so if one’s out the other one can come over and we are very happy that Patrick was able to come over and ride for us,” said Gerard, regarding Moloney returning to cover for Bayliss during his second suspension. “It’s a privilege to be riding this calibre of animal when I come over to New Zealand,” Moloney said. “Pam and Mike (Moroney) have given me these good opportunities, putting me on the right horses that make my job look easy and she was always travelling like the winner. Syndicate manager, breeder, and owner Kylie Bax said: “She (Ruby Armani) likes this course, was a winner here on debut and won even better today. “Thank you to my owners and shareholders, you’ve given me great support and many of you are here to see her win. “Patrick rode her very well, and Ballymore have done a great job to get Jake and Patrick to ride over here.